It is an exciting time to be a paddler in Illinois–there are a lot of projects and programs working towards improving paddling in Illinois. I would like to thank you in advance for taking some of your valuable time and supporting these activities, and others as they come up. Please feel free to contact me and I will put you in contact with the appropriate people for these projects. Several communities are looking to improve their waterfront presence, and we have the opportunity to provide input. Notably there are active projects along the Fox River in St Charles, Carpentersville, and Algonquin. There is another project on the KanKakee River in Wilmington, IL. Proposed legislation passed the House and Senate and is awaiting the Signature of our Governor to help improve the Water Usage Stamp by exempting out-of-state paddlers from the Stamp when they participate in paddling events in IL. Our Water Usage Stamp task force will continue to work on promoting incremental improvements of the program. IPC Programs Remain Active: The River Closure Task Force continues to work with the DNR to address arbitrary river closures based on ‘high water’. Water TrailKeepers Continues to run cleanups; Paddlers Patrol continues to provide safety at events. Our Newsletter Committee has been working hard to produce these newsletters, and our web committee has worked hard to update the IPC Website. Every year many people die because of low head dams. Above the dam, boaters may get too close to the dam and go over. Below the dam, fishermen wander too close to the dam and are sucked into the hydraulic. Many of us have dam stories – and we have all damned the dams at one time or another. Dams had their uses when they were built. They were used to form a pool for a Mill Race. They were used to provide a ford across the river (e.g., Dam # 1 and Dam # 2 on the Des Plaines). They were used for recreation (e.g., swimming, canoeing, boating); in fact, you can still see the bolts that anchored a diving board above Dam # 2 on the Des Plaines. Dams were used for flood control. They were used for sanitation – sewage went directly into the river, and in low water, it was exposed to the air and smelled; dams kept the water level up and the stench down. Ryerson Dam was built so Ryerson’s horses could cross the river below the dam. A considerable amount of dam removal has already, or will be occurring, on the Des Plaines River. Work is under way to remove Hollister Dam and Half-Day Dam. If not already completed, the dam in Des Plaines and Dam #4 on the Des Plaines River are scheduled for removal. 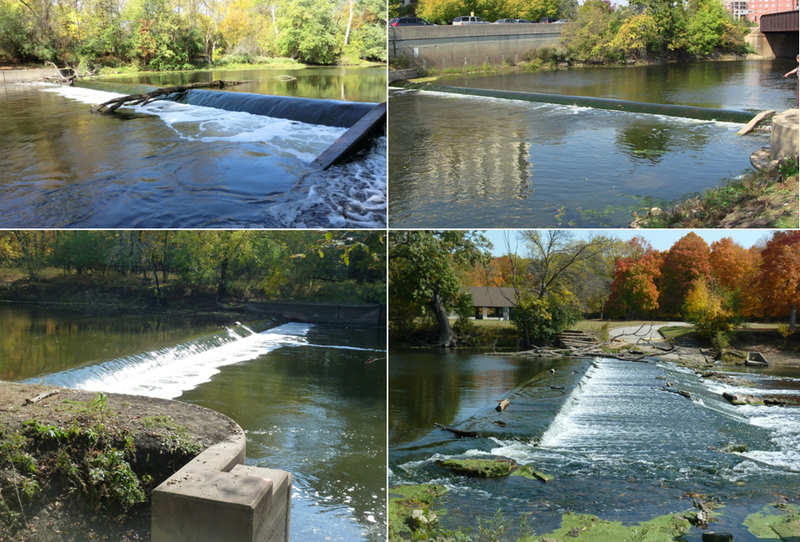 Already removed on the Des Plaines River are a small dam in Lockport, Riverside Dam, Ryerson Dam, Dam # 1, and Dam # 2. The Des Plaines River should be dam-free by the end of the summer of 2015. Other dam removal projects include the Carpentersville Dam on the Fox River – this is the latest dam removal announcement. The dam at north Batavia will be removed by nature, if it is not removed by man first (i.e., the dam south of Batavia on the Fox River). 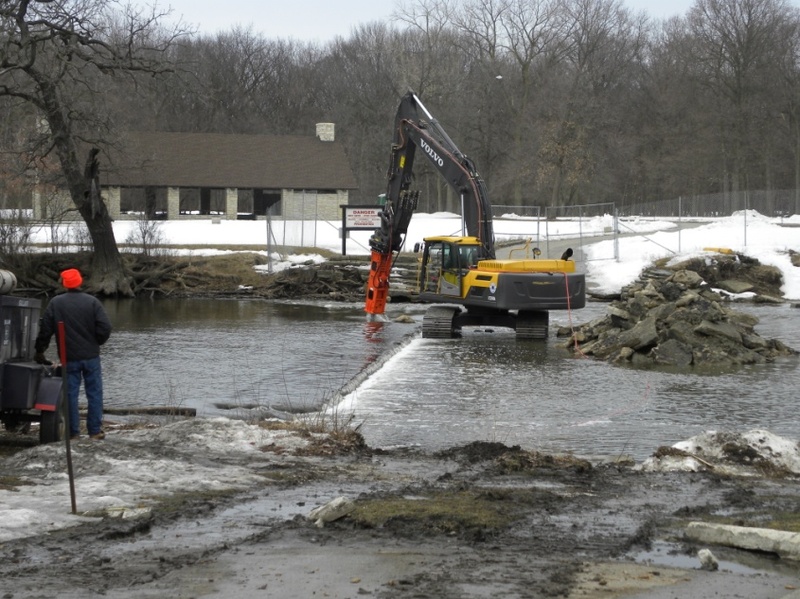 In addition, the dam has been removed from the West Branch of the DuPage River in Warrenville. The dam in Yorkville has become a whitewater play park with an annual slalom race, and plans are being considered to build whitewater courses for several other dams. St Charles is considering a grand plan with several grades of whitewater chutes. There has been talk of a whitewater chute in Aurora (there is an attempt in place that was built several years ago, but it never was really functional). Rockford is also considering a whitewater chute on the Rock River (at present, it would require a long portage to get around the dam). Finally, Algonquin is also considering a whitewater conversion on the Fox River. Good news. Removing dams is safer – cutting the possibility of drowning and eliminating portages. It is better environmentally for fish and for the flow of the rivers. Although the water level above the dam will drop, the water level below the dam rises. The Vic Hopp Race starts at Dam # 1 on the Des Plaines River – go upstream and return. This year with the dam removed and low water level, we had one of the most interesting starts to a race that I have ever encountered. We were hitting bottom with our paddles, but the waves from all the boats tossed us this way and that. We would get a wave and shoot out ahead of a nearby boat only to be stuck behind another wave and have them pass. This was for the first several minutes of the race. Wish I could have said it pushed us to the front of the pack, but alas, that did not happened. It can be serene, peaceful and quiet; or wild, raucous and dangerous; it can be tranquil and slow; or fast and racy and competitive. NOW TAKE ONE OF EACH OF THE ABOVE AND MIX AND MATCH IT ANY WAY YOU WANT AND YOU GET PADDLESPORT. Geography mostly determines the kind of water we live nearby. And many of us spend hours driving to escape this geography in pursuit of our preferred type of water and action. But wouldn’t you agree that no matter what kind of craft we paddle, which stick we use, what water we like to be on and what action we prefer, we still have more in common than sets us apart! Just imagine for a moment that all paddlers in this country would unite as one group – that the recreational canoeist supports the Olympic racer, the whitewater fanatic writes in support of coastal protection… And one organization with united voice demands and supports legislation for conservation of waters; speaks in unison against unnecessary fees or taxation; promotes water safety through education, advocates for access. Just imagine what a powerful group we could be if we spoke in one voice, pooled resources, and acted together. This doesn’t mean we couldn’t paddle the type of craft with the kind of stick on the choice of water and the type of action we preferred… it’s just that we’d all unite behind the fact that we all need a craft that floats us, a stick to propel us, and water in liquid form… the rest are just minor variables! And maybe we have a starting point with the recent merger of the ACA and USACK.